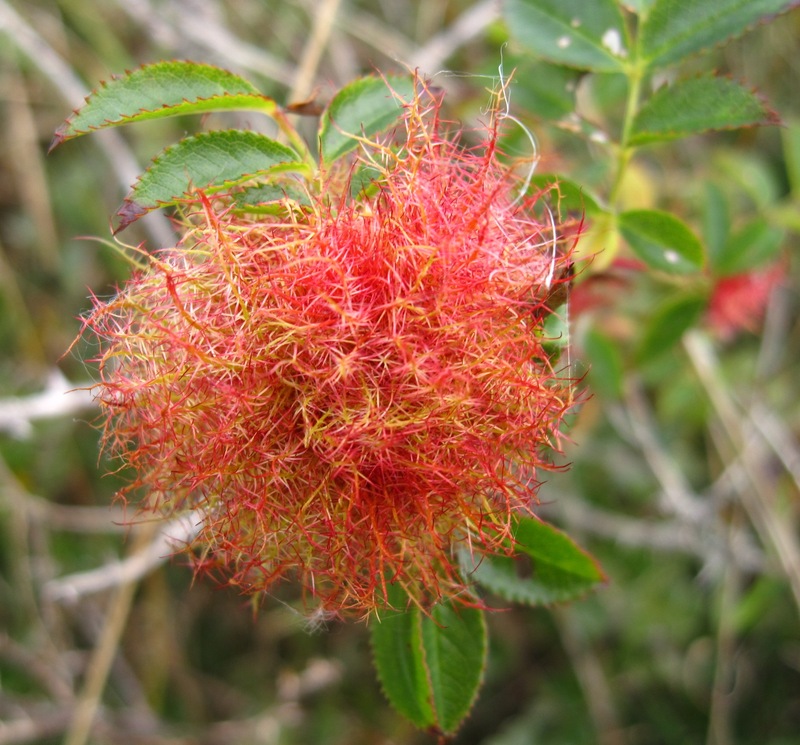 Robin’s pincushion galls are common on wild roses, but uncommon on most cultivated varieties. They look like a tangle of red and yellowy green filaments making a brightly coloured pom-pom on the rose stem. Like many galls, they are caused by a little wasp and although the galls are very conspicuous, the wasps are very inconspicuous. The female wasps can reproduce without males and, maybe consequentially, males are quite rare. Inside the pincushion gall there will be several wasp grubs that will pass the winter within feeding on plant tissue. The larvae somehow control the plant tissue around them causing it to form big, juicy cells which are continuously replenished. In the spring new wasps will emerge: mostly they will be females and without the need for males, they will be able to go and lay eggs in rose bushes to start the cycle again. One of the alternative names for the gall, bedeguar, is said to originate from the Persian language and means brought by the wind. The galls are unlikely to be a problem in gardens except on wild-type roses. They can be valued for their own attractiveness and interest and generally they will not cause harm to their host plant. However, if you really don’t like them, just snip them off. Nooo don’t snip them off… leave the wasps alone! I love the name Brought by the Wind…those Iranians, so poetic 🙂 Thanks for the explanation…I photographed one recently on the blog. © hortographical, 2019. Unauthorized use and/or duplication of this material without express and written permission from this blog’s author and/or owner is strictly prohibited. Excerpts and links may be used, provided that full and clear credit is given to hortographical with appropriate and specific direction to the original content. hortographical Create a free website or blog at WordPress.com.